Carl G. von Iwonski (1830-1912) was born in Prussia, on April 23, 1830. His father was an officer in the Prussian army. In 1845 Iwonski immigrated to New Braunfels. He did not study art at first, however it is thought he later studied under Herman Lungkwitz. In the mid 1850’s he established his first art studio in New Braunfels working in pencil, ink, watercolor and oil. Mostly portraits of German settlers and of the theatre and scenes of New Braunfels. In the late 1850s Iwonski moved to San Antonio where he learned photography form William DeRyee which he became a partner in the firm. 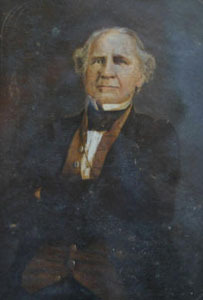 Iwonski would hand-paint over tin-type photographs giving exact likeness of the sitter including works of Sam Houston. Carl Iwonski later set up a photographer studio in San Antonio with fellow artist Hermann Lungkwitz. They continued their business together until Hermann Lungkwitz moved to Austin in 1870. Iwonski also painted landscapes, scenes of the missions, pioneer life, theatre stage, portraits, Indians and Civil War episodes. He was best know for his portraits of Pioneer Texans. Iwonski returned to Germany in 1873 and died on April 4, 1912. We buy and sell fine examples by this Texas Artist and have been a dealer since 1988, buying selling and specializing in works by Carl G. von Iwonski along with other important Texas Artists. Meet The Dealer. Always looking to purchase fine examples of Carl Iwonski's Texas scenes. Please call or email to discuss your painting and obtaining a free and accurate evaluation & offer or acquiring art for your collection.